I know – I know – it is all the rage right now to lament how we are not getting exposed to enough microbes and how that is damaging our immune system and such. And certainly, that is partly true. And we are definitely overusing antimicrobials in all sorts of situations (e.g., see my posts on this topic such as – A plea to stop ignoring microbial ecosystem effects of antimicrobial agents and A disturbing trend — casual and reckless use of antimicrobial agents in building materials. But it seems to me that we (that is, society) are drifting a bit too much towards overdoing it with the boosting exposure to microbes. Lick the toilet seat. Roll around on the subway floor. Stop using soap. And more. Yes, it does seem that we have over-sterilized our world. But, at the same time, danger does still lurk around many corners. Just the other day I heard someone I did not know talking about how our drinking water was too sterile (actually, I think they said “clean” but I believe meant sterile). And so I decided to engage this person a bit and introduced myself as a microbiologist. And I asked why they thought our water was too sterile and they then mentioned something about hearing a radio show discussing the hygiene hypothesis. I then pointed out that there still are bad microbes out there and that we probably should not go overboard in the “all microbes are good” notion. I expected an argument but they agreed and said something like “yeah yeah – I work in a dentists office and we do our best to keep everything there really clean”. We discussed the issue a bit more and I think they accepted that maybe we do not want our water to be too full of microbes. Anyway, eventually we went our separate ways and I kind of forgot about the encounter. An outbreak that could have long-term effects on the children’s health is raising awareness about the risk of bacterial infection from water at the dentist’s office. No connection to the person I met. But the story captures a bit of the gist of our conversation in that it is about water that sat around in a dentists office and was, well, unclean. Investigators believe the bacteria grow in low-level stagnant water that isn’t flushed. 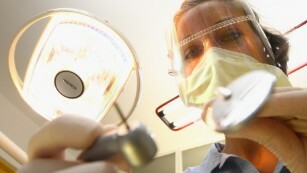 In a dental setting, that water is used during treatment, and when a tooth is capped, it can trap the bacteria inside. Calling it “a weak bug,” Zahn said most people who encounter M. abscessus simply flush it away during their daily life. But patients who have had a pulpotomy aren’t able to get to the infected area inside the tooth, allowing it to grow. I think it is still unclear exactly what happened here. But it is a good reminder that microbes can grow in stagnant water systems (and even flowing ones). And that one should never assume that water coming out of a pipe / sink / tube is clean. And we also should remember that sterility of water can be a good thing in some situations. Yes, we are damaging the microbial diversity around us probably too much. But sometimes, killing and filtering and removing microbes is still a good thing.